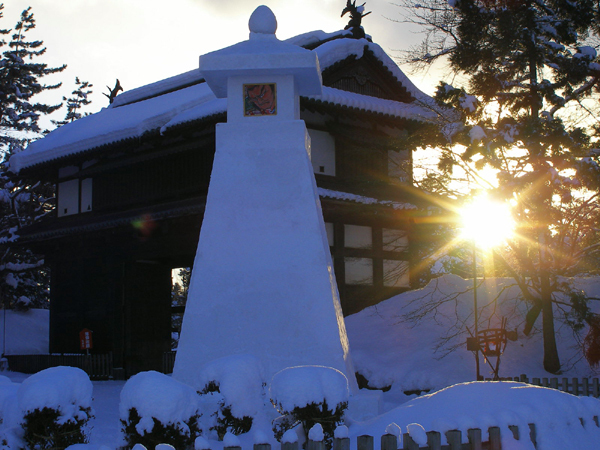 Winters are long in Tohoku, the northern region of mainland Japan. 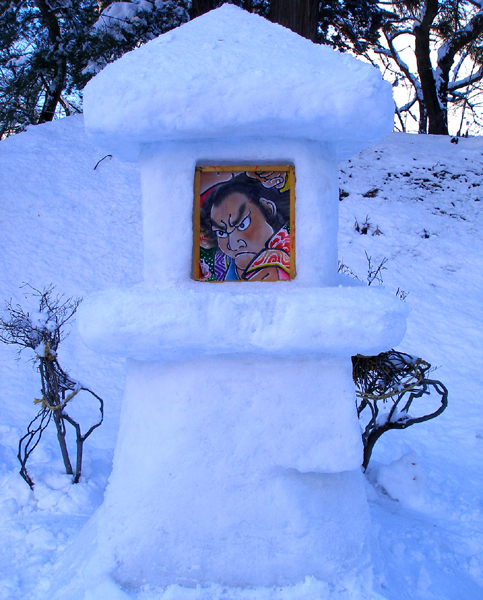 Snow and ice are common fare there. A skier's boon but a common man's burden. In ages past before sports skiing and winter fashion, winter was something to be dreaded and suffered through. 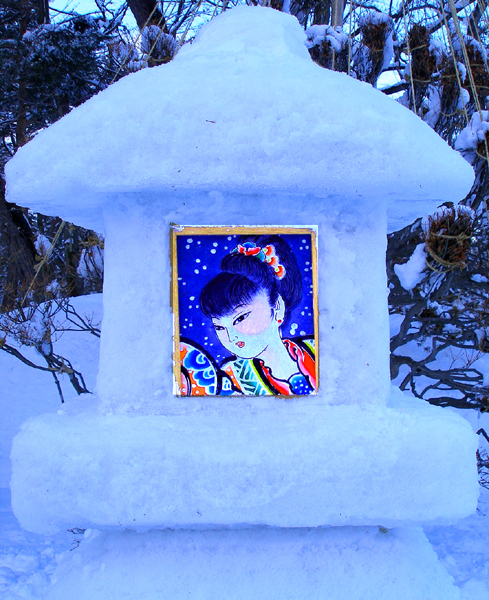 It is no wonder that a multitude of snow festivals dot the Tohoku region. 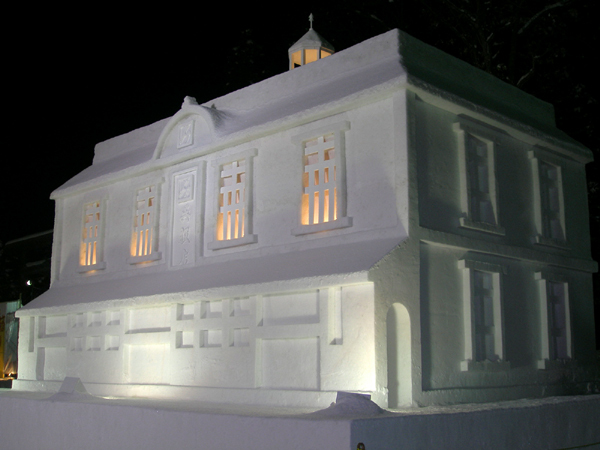 These festivals are the locals' way of making winter seem a little less unfriendly and a little less bleak. 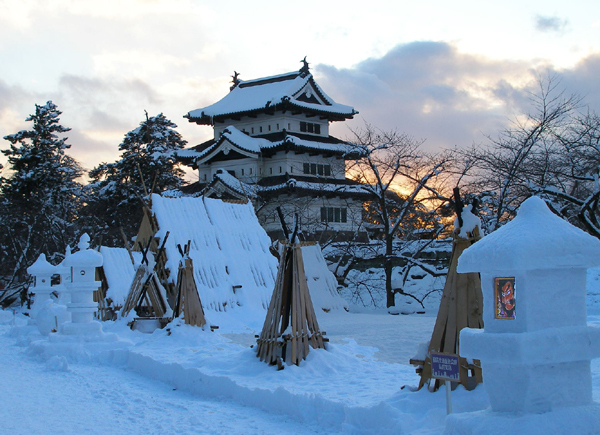 One such festival takes place in Hirosaki in the Aomori Prefecture which is the northernmost area of the Tohoku region. 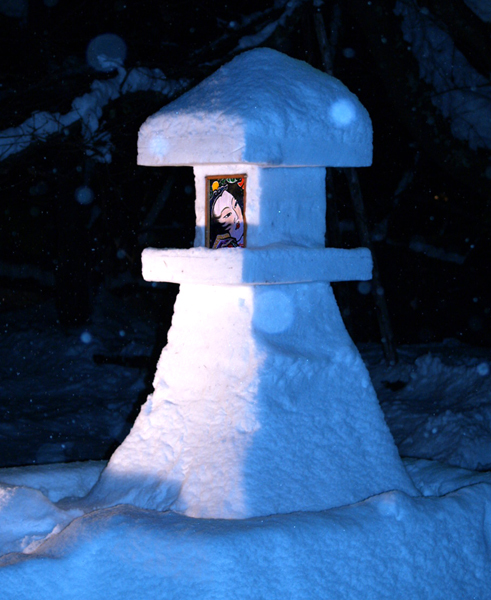 Capitalizing on the beauty of winter, residents of Hirosaki create lanterns made completely made of snow in early February. 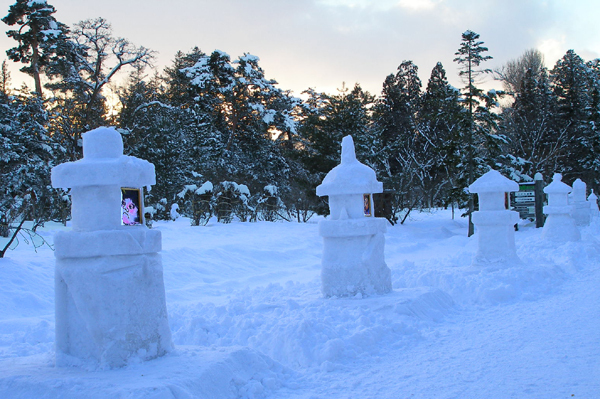 The lanterns for the most part resemble the type of lantern found in Japanese gardens and shrines. 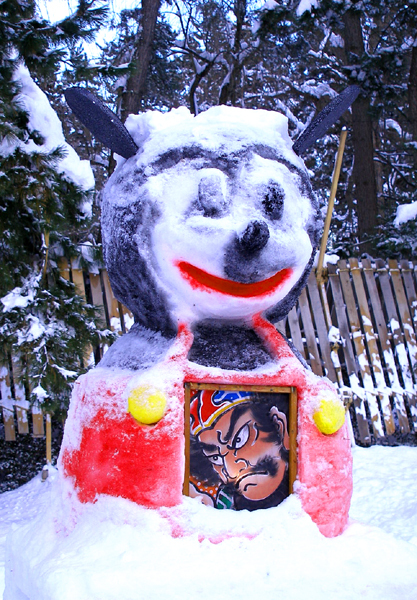 There are hundreds of these spread through the grounds of Hirosaki Castle. 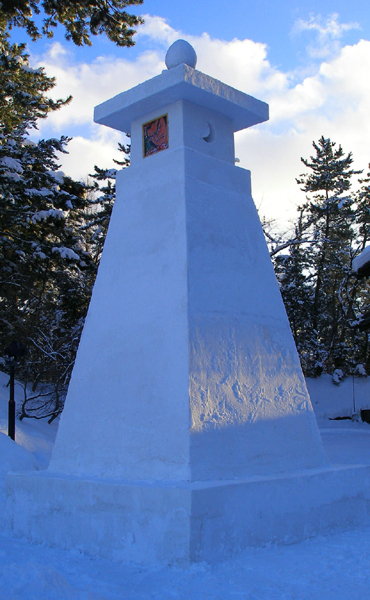 Some of the snow lanterns however are rather avant-garde shaped with just a hint of the essence of a traditional stone lantern. 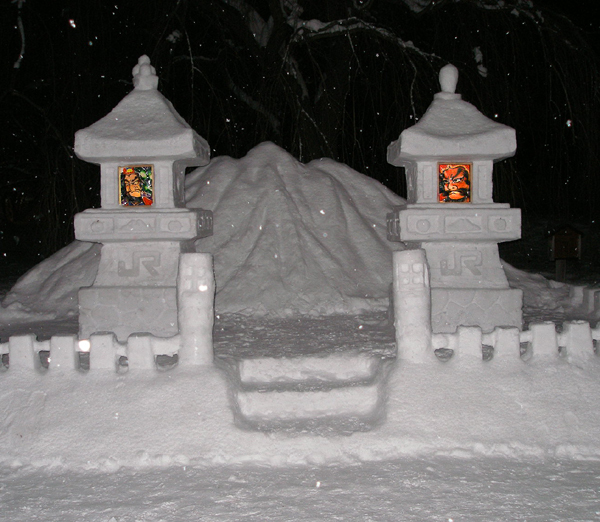 Where in the stone lanterns there would be empty spaces for the placing of candles, painted portraits are set. 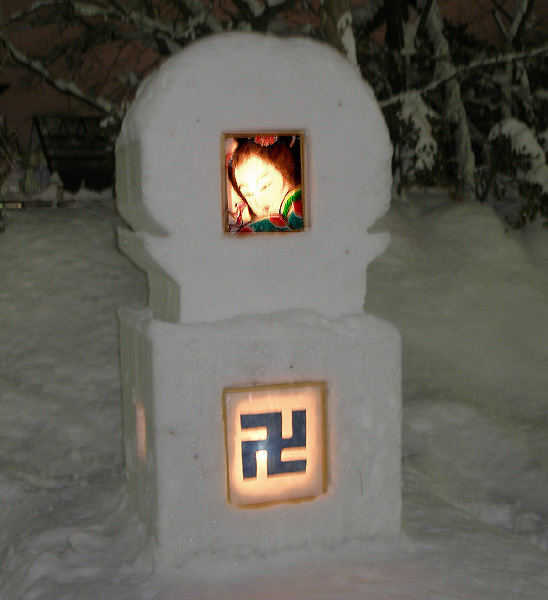 The portraits resemble closely that of Hirosaki's Neputa Festival in Early August. 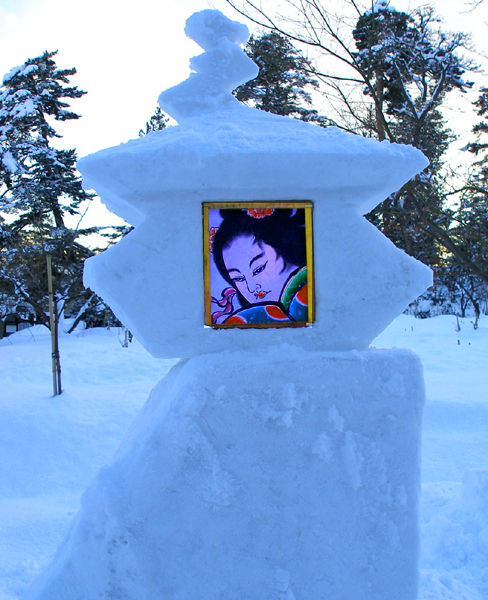 The Neputa Festival consists of large oval shaped floats with painted scenes from Japanese and Chinese stories. 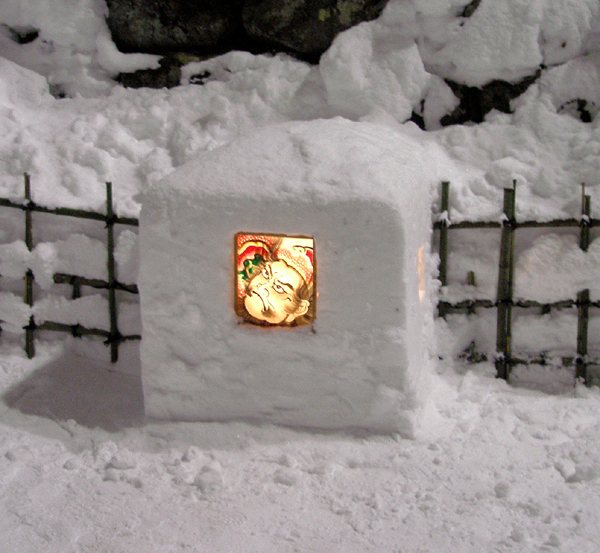 The Snow Lantern Festival's portraits depict the faces of Japanese women, samurai, and legendary Chinese heroes from the works of the Three Kingdoms and the Outlaws of the Marsh. In the evening, they are illuminated from within much in the same way the Neputa floats are. 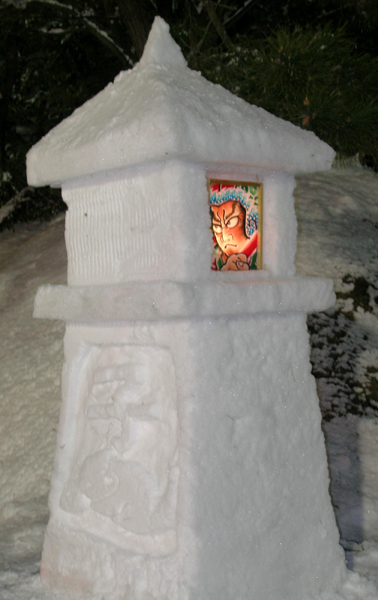 While the Neputa Festival goes back centuries, the Snow Lantern Festival goes back only decades - three to be exact. 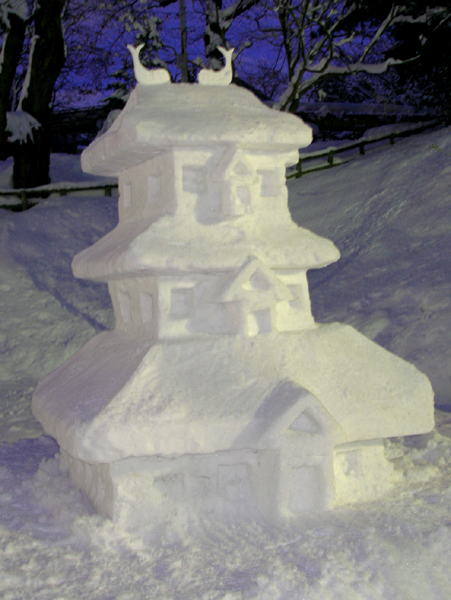 The Festival started in 1977 as a way to bring the community together during the long cold winter. 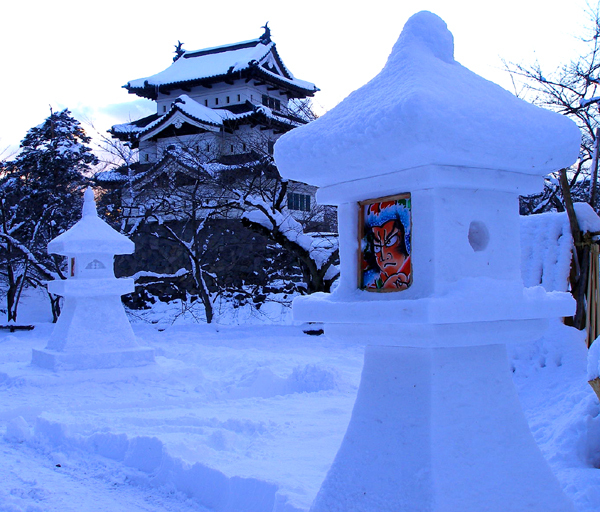 It has since become one of the five biggest snow festivals in the Tohoku area. 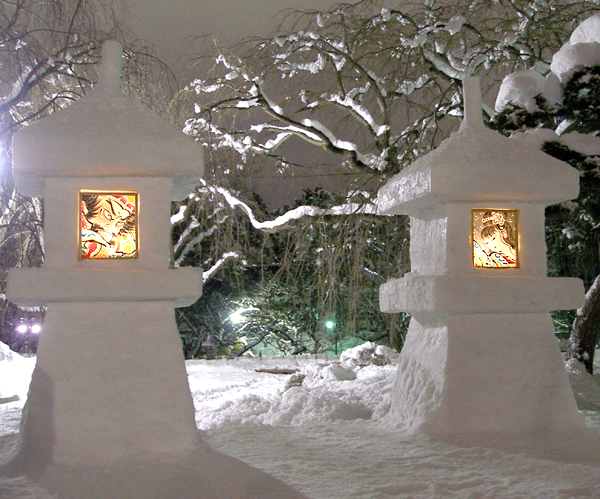 Throughout the Festival, local volunteers patrol the grounds looking to repair the lanterns and clearing the pathways. 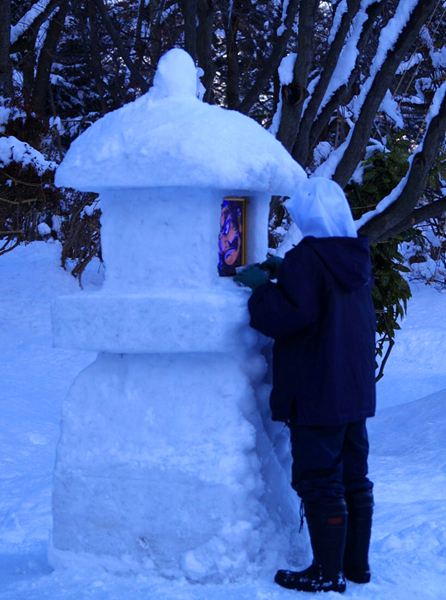 They place the portraits on the lanterns and fasten them in place with short bamboo sticks. 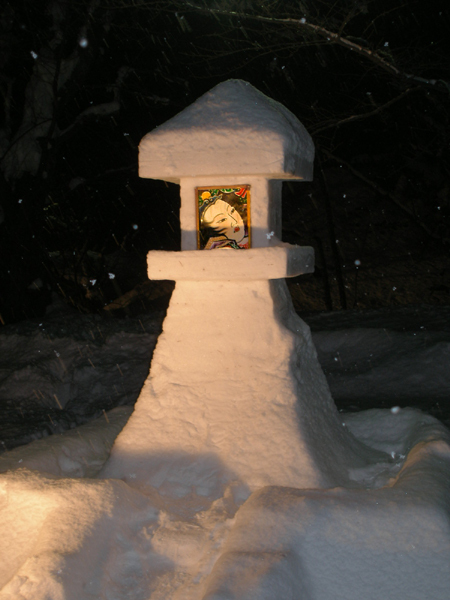 Across the old moat, dozens of small kamakura - or snow huts - are set up each with an individual candle. 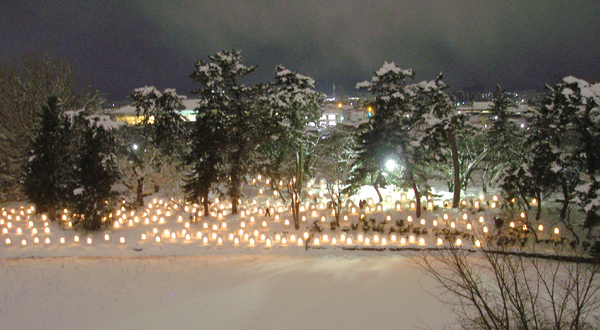 Hirosaki's Snow Lantern Festival may not be a major extravaganza like the Snow Festival a little further north in Sapporo but it has a pleasant charm of its own. 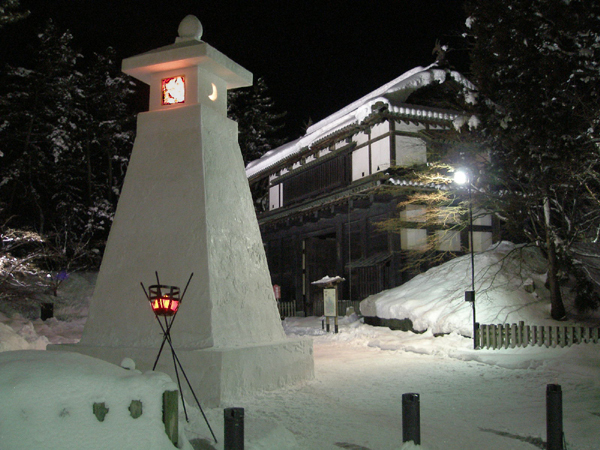 The Snow Lantern Festival in this respect represents the Japanese character best - simple but elegant; the quintessential concept of Japanese wabi-sabi. The only drawback to all this charm and elegance, however, is the music they choose to play in the background. 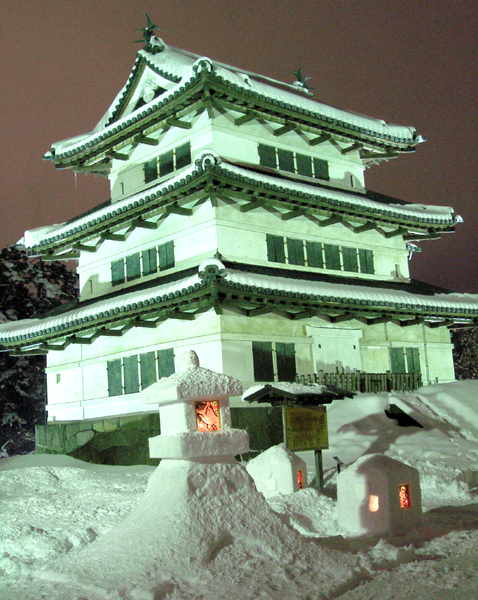 Instead of playing traditional Japanese music particularly the guitar-like samisen which Hirosaki is known for, they play less than quality modern music that is a cross between old style Enka and modern pop music from mediocre artist without financial clout to sue the city for playing their music. 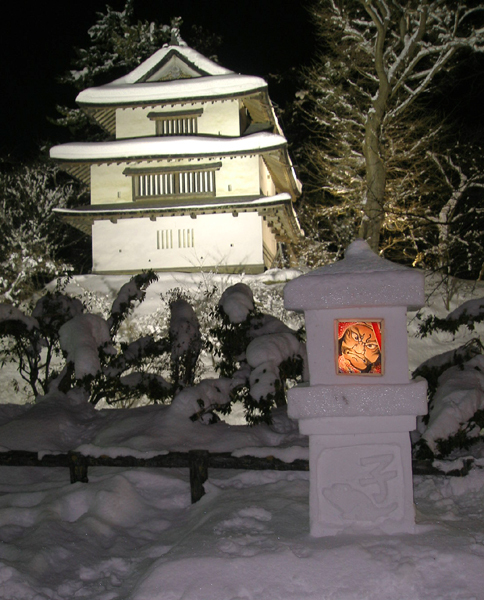 Music aside, the illuminated snow lanterns and the miniature kamakura snow huts with Hirosaki Castle as a backdrop make for a winter fairy-tale land.